Is now the time to go all in on a BYOD (Bring Your Own Device) offer? Virtually every visitor has a mobile device in their pocket, so when cultural sites are considering an audio or multimedia guide we’re often asked whether dedicated on-site audio/multimedia guides are still relevant. We’ve been working in this sector a long time, we provide on-site devices, but we also create apps too, so we thought we would share some of our thoughts on why on-site devices might still be the better option over the BYOD experience. Perceived value by visitors is paramount to an enjoyable visitor experience, many of our clients offer free audio/multimedia guides in their ticket price, with the majority of visitors having one, the audio/multimedia guide becomes a central part of the experience. If you ensure you have great content that tells your stories really well and engages your audiences in the overall experience, you will see more enjoyable visits and rising positive feedback. Do you want to publish your content to anyone at anytime, anywhere – with say a virtual tour or website? Or do you want to hold something back exclusively for the on-site visit and want them to only experience specific content in the context of a site visit? An on-site device is the perfect way of providing great content to visitors on location only. 3: The (tricky) experience of using an app on site. These are all simple but effective barriers which visitors will consider before downloading a tour app. 4: Multimedia content is big! The best multimedia tours out there have really immersive and creative content (often audio, film and interactives) and can be in multiple language and access versions, which unless a venue has a high performance Wi-Fi, can make this difficult to stream effectively to mobile devices (how much do you hate the buffer icon? ), or just makes a downloadable app huge (which takes up lots of memory). One challenge with developing an app that utilises mobile device’s features (e.g. camera for image recognition/augmented reality, or bluetooth beacons), is ensuring that the app works across platforms (iOS, Android, Windows etc.) and multiple devices your visitors might be using (legacy devices too, not just the latest smartphones). Depending on the project size, this could require extensive testing and development, which is costly and if you don’t get it right, severely impacts the user experience. With on-site devices, you can design and perfect the experience to work on one single device, negating the ‘it doesn’t work on my phone’ complaints and subsequent poor visitor experience. Virtually everyone has a mobile, but limited number of visitors are adopting the behaviour of using mobile app tours instead of onsite devices. The choice certainly comes down to what visitor experience you want to create – you may intentionally want and off-site virtual experience (in which case an app /website is a likely option). As you can see from our list, there are still compelling reasons for having onsite devices. Over the next generations of mobile devices, networks and Wi-Fi advancements, we may well see the balance change towards a BYOD, when rich content can be streamed effortlessly and batteries last weeks (like my old Nokia!) 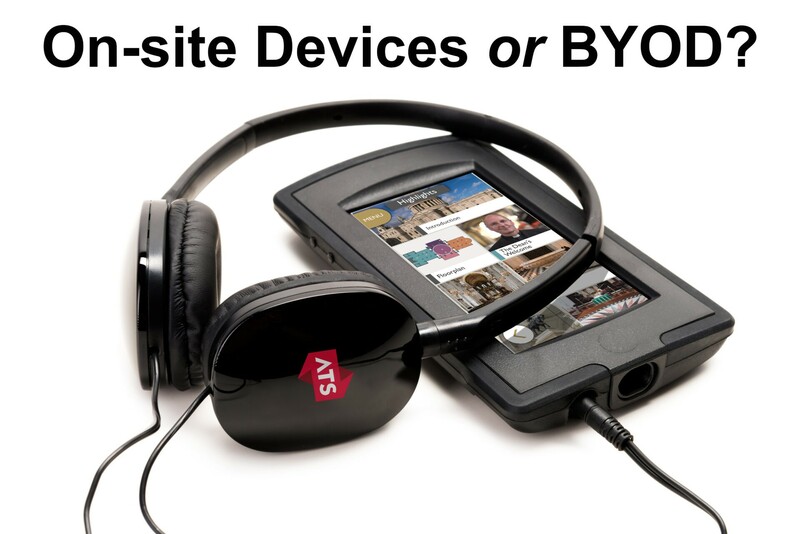 but right now there is a healthy demand for on-site devices as part of a great integrated visitor experience. Have a project idea or thinking about devices or apps? Give our friendly team a call on 02392 595000, or email us.